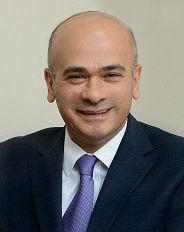 Abdul-Nasser El-Kassar is an associate professor at Adnan Kassar School of Business. He holds a PhD in Mathematics from the University of Louisiana, Lafayette, and has received the Post-Doctoral Bridge to Business Program certificate from the University of Florida. With a background in both mathematics and engineering management translated by two master degrees from University of Louisiana, his research ranges from cryptography to engineering management and its underlying mathematics. His research has been published in recognized journals including the Journal of Mathematics and Statistics, Global Review of Business and Economic Research and the Business Review, Cambridge. Executive Education Project Manager, LAU, 2012-date. Offered a seminar on Research using Mathematica at the Middle East Mathematica Conference, LAU, 2009. Haraty, R.A, El-Kassar, A.N. & Fanous, S. (2014). Hardening the El Gamal Public Key Cryptosystem in the Second Group of Units, International Arab Journal of Information Technology, 11(5). El Haj Chehade, E.A., El Tannir, A. & El-Kassar, A.N. (2012). The Technical Implementation of the New Generation of the RFID System, Global Review of Business and Economic Research, 8(1), 35-51. El-Kassar, A.N., Salameh, M. & Bitar, M. (2013).The Effects of Time Value of Money on the EPQ Model with Imperfect Quality Raw Material. Academy of Information and Management Sciences Journal, 16(1), 11-18. El-Kassar, A.N., Salameh, M. & Bitar, M.(2012). EPQ Model with Imperfect Quality Raw Material, Math. Balkanica, 26, 123-132. El-Kassar, A.N., Chams, N. & Karkoulian, S.(2011). Organizational Climate and its Effects on the Employees’ Commitment. The Business Review, Cambridge.